"What Is Wrong with My Horse?" Horses are herd animals and instinct tells them that there’s gotta be a boss. If it’s not you, it’s gotta be them. Here’s how to get and maintain control. Is your horse the boss of you? Turn things around by learning to spot the moments when your horse takes control. Sack out and desensitize your horse to scary objects - like your hands, tack and everyday equipment. Here’s how to teach your horse to contain himself (and thus, keep you safe) when something scary pops out of nowhere. Does you horse turn into a basket case every single solitary time he gets near the same darn spot on the trail or seemingly innocent patch of arena dirt? Here’s your fix. When your horse only turns into a freakzoid when you’ve trailered to a distant location - like a show - here’s what to do. Here we’ll learn to relax and slow a high horse with a method so simple that it only has one step. If you have problems with your horse getting “higher and higher” -- or need a way to slow a fast one down -- then this is for you. What you do today determines the horse you’ll ride tomorrow. If you’re guilty of being a bit heavy-handed (as evidenced by a stiff-as-a-statue horse) here’s a Top Five Horse Training Concept that will soften your horse fast. Here are 3 “Rider Checklists.” Together, they’ll keep you safer - and accelerate your training to boot. Here’s one small thing you can do to keep your horse’s attitude in check - and prevent mount-up problems from taking root. If your horse stumbles, cranes his head to the ground, takes halting steps, doesn’t want to “move out,” or has grown irritable, it might be that his feet are hurting him. Here’s how to tell. Biting is the worst vice your horse can have. It’s more dangerous than bucking, than rearing, than kicking -- more dangerous than anything else you can name. Here’s what to do. Here’s an easy fix for horses that get cinchy or irritated when you tack up. Addressed here: Horses that stop moving and stubbornly refuse to take another step. Two things not addressed here (at least not in-depth or specifically): Horses that have gradually become “dead-sided” and crossing obstacles. Learn a quick fix to get a horse moving again if he freezes up when being led -- with an eye toward lasting changes. Teaching your horse to lift its feet on command is actually much simpler than folks tend to want to make it. Here’s how. 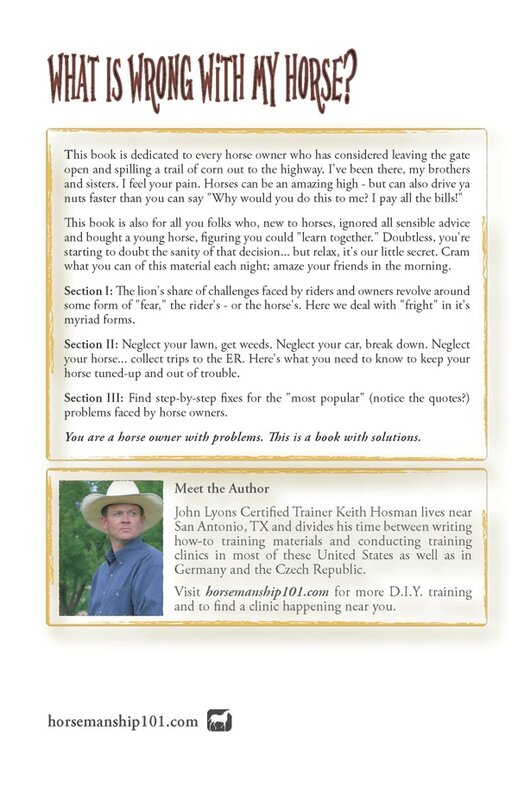 ​A book full of solutions for the horse owner. In three parts. Section I: "Fright" in it's myriad forms. Section II: Neglect your lawn, get weeds. Neglect your car, break down. Neglect your horse... collect trips to the ER. Here's what you need to know to keep your horse tuned-up and out of trouble. Section III: Step-by-step fixes for the most common problems faced by horse owners. You are a horse owner with problems. This is a book with solutions. This book is dedicated to every horse owner who has seriously considered leaving the gate open and spilling a trail of corn out to the highway. I've been there, my brothers and sisters. I feel your pain. Horses can be an amazing high - but can also drive ya nuts faster than you can say "Why would you do this to me when I pay all the bills?" 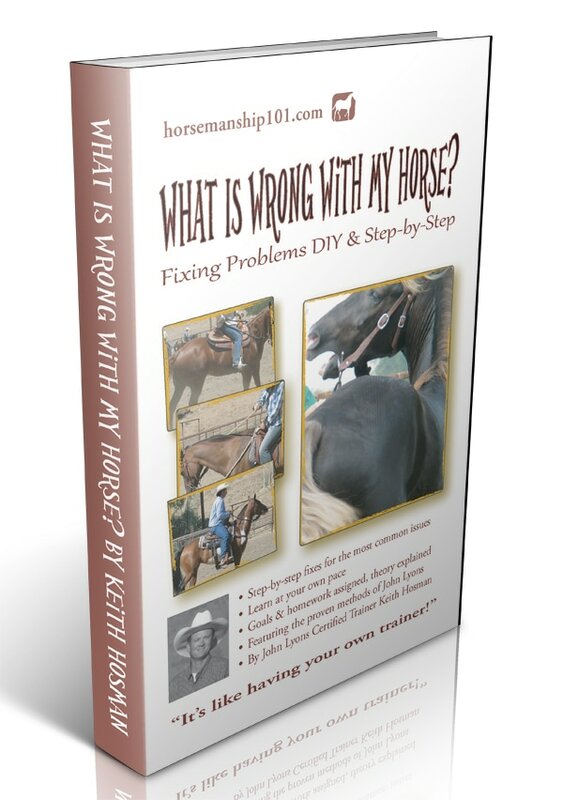 This book is also dedicated to all you folks who, new to horses, ignored all sensible advice and bought a young horse, figuring you could "learn together." Doubtless, you're starting to doubt the sanity of that decision... but relax, it's our little secret. Cram what you can of this material each night; amaze your friends in the morning. Section I: The lion's share of challenges faced by riders and owners revolve around some form of "fear," the rider's - or the horse's. Here we deal with "fright" in it's myriad forms. Section II: Neglect your lawn, get weeds. Neglect your car, break down. Neglect your horse... collect trips to the ER. Here's what you need to know to keep your horse tuned-up and out of trouble. Section III: Find step-by-step fixes for the "most popular" (notice the quotes?) problems faced by horse owners. ​​SORRY, I DO NOT SHIP INTERNATIONALLY (INCLUDING CANADA).